Brian and I have finally started the process for having our kitchen remodeled! Whew! We will be seeing a 3D model of what our kitchen will look like on the computer at the store we are using this Wednesday. I really can’t wait! I am looking for a really clean, neutral and stylish look for our kitchen. 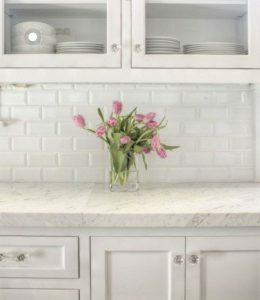 We are looking at ‘shaker style’ cabinets, a marble looking (but, really it’ll be quartz) counter top and subway tiles for the backsplash. We also want a butler sink in stainless steel. We also want to update the lighting. We are looking to add a serving section with a countertop and cabinets above and below, plus we’re swapping the placement of the fridge and pantry to get more pantry space (and it’ll take out a weird corner in the kitchen). I am thinking about doing several kitchen posts here on the blog about the entire process. They are saying it’ll be 5-6 weeks of full-time work… Say what?!! I am not sure how we are going to survive that long without a kitchen! But, I will love it when it’s done! 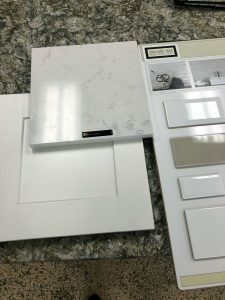 The picture above shows some of the materials we have selected for our kitchen. Eek! The photo above sort of looks like what we’re going for with our kitchen. Except, I’d rather have the pull handle knobs and we will only have glass front cabinets in the serving area on top. I’m also hoping to get crown molding on the tops of the cabinets, since we have vaulted ceilings. Brian and I just booked a trip to Secrets Maroma in Cancun! Oh gosh, I am so excited! We love to get away, just the two of us every summer and we weren’t sure if we were going to be able to this summer. Well, it turns out we can NEXT month! We seriously just booked the trip 2 days ago! 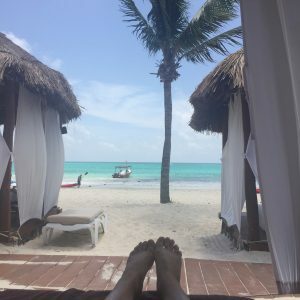 We LOVED Secrets Maroma so much, that we decided it’d be perfect for us to go back again. And, I’m not one that likes to do a repeat vacation, I love to see new places. But, it sounded like the perfect vacation for us! Both of these jumpsuits are from PinkBlush. I just get nervous about wearing a jumpsuit with a floral print all over it, but this would totally fly at a tropical place, right?! But, I can’t decide which color I like best. Orange or green? Help! But, I also love, love, love blue/white stripes right now. 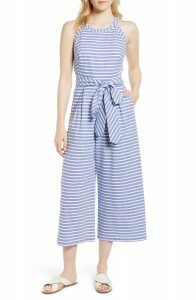 The ruffle trim jumpsuit on the left is from PinkBlush and the wider legged jumpsuit on the is from Nordstrom. There is def. a big price difference between PinkBlush and Nordstrom, so I’d probably go with the one on the left. So, which one should I get? 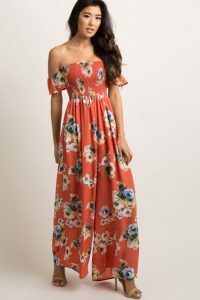 Should I go with a floral jumpsuit (and which color?!!) 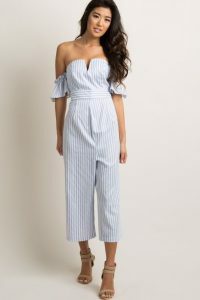 or a blue/white striped jumpsuit? Help me decide in the comments! 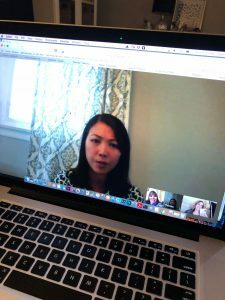 I had a fun live chat session with bloggers friend Lauren from Mom Home Guide and Tee from Beauteeful Living before Easter. I had never used Google Hangouts before, but my husband helped me to set it up. This was the first time I had talked live to Lauren, even though we text everyday all day long! I can’t wait to meet Lauren at Haven this summer! Tee was really fun to talk with as well! We are going to set up another Google Hangout session before our kids are out for the summer. We talked for 2 hours, it was a lot of fun! So, I’ve been wanting to take more #OOTD and outfit selfies for my IG feed, instead of just always showing a photo that ties to a blog post. Well, I gave it a try this week and WOW… taking a full body outfit selfie is tough work! I have a selfie stick, but it is so hard to hold it steady and for long enough to get the perfect angle. I seriously felt like I was getting selfie stick carpal tunnel after awhile. Does anyone have any tips or are there any blog posts out on this matter that would help (or have any of you done a blog post with tips)? It would help me so much! Let me know in the comments. I’ve noticed a lot of bloggers take the photo from the neckline down and crop off this head. ANY help would be wonderful! I am working with Shell right now on sharing their Fuel Rewards® program that will save you money at the pump! It’s so easy, you sign up for FREE at this LINK and you get an ALT code (it will be your phone #) and you enter this number at the pump before filling up. You can follow your savings on their app, which is so cool! You’ll save 25 cents/gallon on your second gallon of gas after signing up through May 27th! 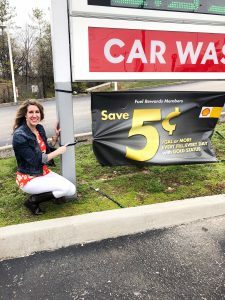 You’ll also automatically become a Gold Member and save an additional 5 cents/gallon (to maintain Gold Status, you must fill up 6 times in 3 months, otherwise you go to Silver Status and still receive 3 cents per gallon savings). Well, that’s it! 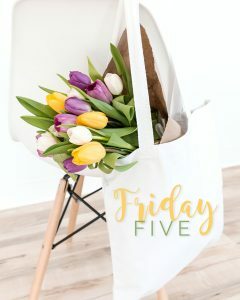 I hope everyone has a great weekend. Part of this post was compensated by Shell, but all opinions are mine alone.